"Shrine" is an artistic intallation that combines such elements as sculpture, drawings and music. Its aim is to pay tribute to all anonymous victims of KL Lublin. The exhibition was opened on July 23, 1999, on the 55th anniversary of liqudiating the concentration camp at Majdanek. It is the answer to the appeal made by gomer Majdanek prisoners who in 1994 wrote the following words: "Let the ashes that are gathered here and scattered all over the world give rise to the new sense of humanity that would be close to everyone." "Shrine" is a multimedia "light and sound" performance. 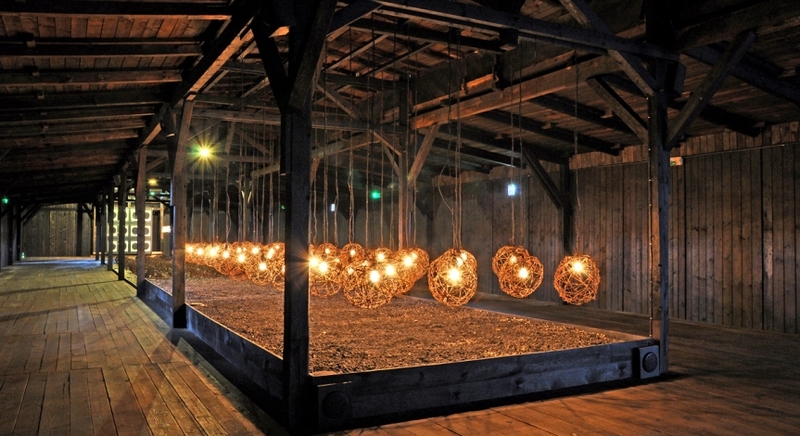 A composition of barbed wire balls with light inside is the metaphor of the fragility of life as well as the reminder of nationalities of Majdanek prisoners. The last part consists of graphic composition referring to the form of altar and a book with the names of the commemorated nationalities. T/he artistic forms are completed with atmospheric music accompanied by the sound of quiet prayers of different religions and accounts by Majdanek prisoners. The exhibition is open between April 1 and October 31 from 9.00 to 17.00, excluding Mondays, national and religious holidays.